GENEVA - The president of Palestinian Authority Mahmoud Abbas has urged the world's nations to defend the two-State solution for the Israeli-Palestinian conflict by recognizing Palestine. He was addressing the first 2017 session of the United Nation Human Rights Council in Geneva on Feb. 27. "We call on countries that have recognized Israel and believe in the two-State solution to defend and support this solution by recognizing the State of Palestine," said Abass. That call seemed aimed at U.S. President Donald Trump who said in a Feb. 15 meeting with Israeli Prime Minister Benjamin Netanyahu, "Looking at two-State or one-State, I like the one that both parties like. I'm very happy with the one both parties like. I can live with either one." In his speech, Abbas condemned an Israeli law passed earlier in February that legalized dozens of Jewish-only settlements built on private Palestinian land. He also cautioned nations against moving their embassies in Israel to Jerusalem, in what could have been as response to pledges made by Trump his election campaign to move the U.S. embassy from Tel Aviv to the holy city. Abass said, "Palestine will remain the litmus test for this council ... and whether it succeeds or not, will be crucial for the credibility of the human rights system throughout the world." After his speech, Aviva Raz Shechter, Israel's Ambassador and Permanent Representative to the UN in Geneva tweeted, "We are ready to sit together to discuss directly all issues in order to reach a solution, as it was also repeatedly offered by PM Netanyahu." The day before addressing the Human Rights Council Abbas held discussions with the general secretary of the World Council of Churches Rev. Olav Fykse Tveit at the hotel he was staying at in Geneva. 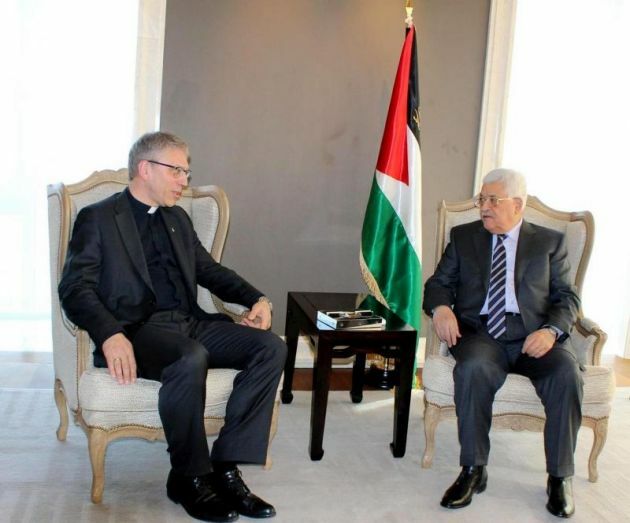 There they discussed a "just peace in Palestine and Israel" said the WCC in a statement. The Palestinian president expressed to the WCC general secretary the importance of the activities of the council in the Holy Land in accompanying Christians and local churches. Abbas said he calls upon local and foreign churches to pay attention to the message of Palestinian Christians and to encourage all non-violent acts to bring peace and justice to Palestine, said the WCC statement. Tveit said at the meeting "Israel since 1948 has been recognized by the U.N. as a State, and the WCC has since then done the same, continuing to uphold the decision to recognize two States." "Our role is to give Christian witness to the world and work for justice and peace," said Tveit as he described the WCC's peace and reconciliation initiatives in the Middle East and beyond. Tveit noted: "We believe peace can be achieved only together with the other. We are called as a fellowship of churches to support the process of just peace." He added "We believe and see that the local churches can and do play a role in promoting peace and justice on both sides of the conflict. It is important to strengthen the church and the Christian presence in the area, so that it can be a strong witness of peace." "No people should be denied their rights and, certainly, no people should be denied their rights for generations. "The unresolved conflict in Israel and Palestine is primarily about justice, and until the requirement of justice is met, peace cannot be established," he added "as Israel's occupation of East Jerusalem, the West Bank, and Gaza nears the 50-year mark, generations have been suffering under this reality."